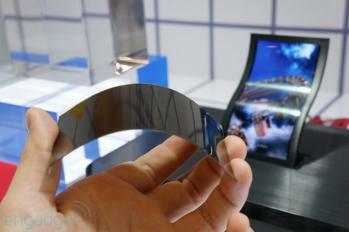 Update: Samsung Display announced today that it too has began flexible OLED mass production. Samsung is making 5.7" Full-HD panels and they expect to release the first phone to use them within days. LG Display announced today that it will start mass producing flexible OLEDs for smartphones. It's not clear whether they actually started panel production or whether production will start soon. LG said that they aim to take an early lead in the flexible display market and introduce new products with "enhanced performance and differentiated designs" next year. LGD revealed some information about the first flexible OLED panel to be produced. It is a 6" panel that weighs just 7.2 grams and is only 0.44 mm thin. Last week we reported on rumors about LG's upcoming flexible OLED phone - with a 6" display indeed. It may be that those rumors actually referred to these production news as the first device is only expected in 2014 and not "within days" as the rumors suggested. LGD's flexible OLED is built on a plastic substrate and it uses "film-type" encapsulation technology. The panel is unbreakable and bendable (it can bend vertically from top to bottom with a radius of 700 mm). 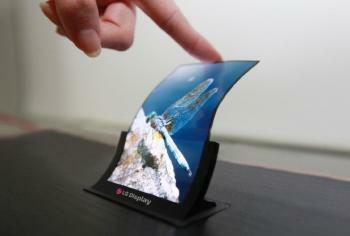 Earlier reports suggested that LG will start flexible OLED mass production in November 2013. LG Display has a flexible OLED 4.5-Gen pilot line that has a capacity of 12,000 monthly sheets. At 100% yield this is less than 500,000 5" panels a month. Yields will be lower, and if LGD indeed opts for a 6" panel, we can expect a very low monthly production (probably 200,000 to 300,000 panels). Samsung is also believed to be launching flexible OLED production soon. Last week we heard reports (later confirmed by some Samsung officials) that Samsung will announce a new premium-edition Galaxy Note 3 phone on October 25 - with a YOUM display. Samsung capacity will also be low, but it will be higher than LGD's capacity. Reports suggest LG will unveil their flexible OLED phone "within days"